All transactions are safe and secure with a reliable history in online purchasing behind each of our associates. 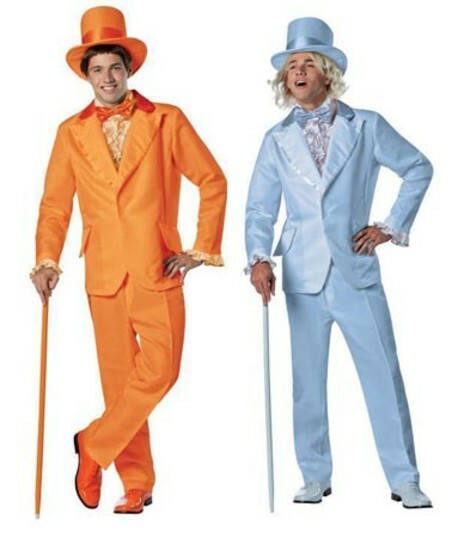 Buy the Dumb and Dumber Costumes to own Dumb and Dumber clothing and merchandise. These Dumb and Dumber costumes are ideal for two friends trying to get some looks and some laughs. They come in orange and blue so you are covered whether you are looking for a Lloyd Christmas costume or a Harry Dunne costume. If you don't need a whole costume or if you are just looking for a daily giggle, then check out the orange tuxedo t-shirt below designed to look like Lloyd's formal wear. For Harry fans, we also offer the powder blue tuxedo t-shirt shown below. If you are looking for something a little more subtle, then peruse the rest of our amusing Dumb and Dumber tees. In addition to the Dumb and Dumber Costumes above, browse the Dumb and Dumber Clothing Gallery for more apparel like men's and women's clothes, kids shirts or hoodies.